10.4 "People gain in Arizona primaries"
19 Assisting CODEPINK's "Fallujah Aid"
22.1 "End The US Occupation Of Iraq"
22.5 PDA "hit its stride"
Raul M.Grijalva is a Communist Party USA affiliated Democratic member of the United States House of Representatives, representing the 3rd district of Arizona. 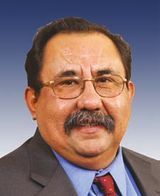 Rep. Raúl M. Grijalva has been a stalwart advocate for economic justice the environment, civil liberties and universal health care. He serves a district in Arizona that is the only one in Congress representing seven separate Native American Tribes; he is a strong advocate of Native American sovereignty. He also supports humane, comprehensive immigration reform; his father was a migrant worker from Mexico who entered the U.S. through the Bracero Program. Before coming to Congress in 2003, he’d held public office for decades -- on the Tucson school board and as a member and chairman of the Pima County Board of Supervisors. He is a co-chair on the Congressional Progressive Caucus. Raúl Grijalva's father was a migrant worker from Mexico who entered the United States in 1945 through the Bracero Program and labored on southern Arizona ranches. Grijalva was born in Tucson, Arizona, in 1948 and graduated from Sunnyside Magnet High School in 1967. He attended the University of Arizona and earned a bachelor's degree in Sociology. Raul Grijalva was endorsed by Our Revolution, an organization run by former campaign workers and supporters of former socialist presidential candidate Bernie Sanders. Raúl Grijalva is a Berniecrat, is a term used for those democrats (generally) running for office who have expressed support of former presidential candidate Bernie Sanders. More than three decades later, in one of his first speeches as a member of the U.S. House of Representatives, Grijalva called for a national holiday to honor Chavez. In 1970 Grijalva helped lead a confrontation with the Tucson City Council, demanding that a “people’s park” be carved out of a city-owned golf course in a largely Mexican-American neighborhood. After months of protests, some of which turned violent, the group prevailed and the city built a park and community center. In his history of the radical Raza Unida Party , Mexican-American scholar Armando Navarro writes that Grijalva became a party leader in Arizona. As Grijalva explained to Navarro, he and his fellow activists weren’t discouraged that the party’s limited base gave it slight chance of winning political power. “We decided to go into elective politics more in the sense of an educational tool rather than an opportunity for winning,’’ he said. Grijalva was so militant that he alienated some members of Tucson’s Mexican-American community. After losing in his first bid for elective office, a 1972 run for a seat on the school board, he began to cultivate a less radical image. Navarro writes that Grijalva “decided to dissociate himself from RUP,’’ and adopted “a much more middle-of-the-road image and approach” that included outreach to non-Hispanics. In 1974, Grijalva was elected to the Tucson Unified School District board and served as a school board member until 1986. Grijalva Elementary School in Tucson was named for him in 1987. From 1975 to 1986, Grijalva was the director of the El Pueblo Neighborhood Center, and in 1987 he was Assistant Dean for Hispanic Student Affairs at the University of Arizona. Grijalva was a member of the Pima County Board of Supervisors from 1989 to 2002, and served as chairman from 2000 to 2002. While on the Board of Supervisors, Grijalva managed a $1 billion budget and "ensured that the county was at the forefront of issues such as domestic partner benefits, labor rights, and transparent government. Additionally, he was a staunch advocate for balanced planning and fairness in land-use decisions". His leadership led to the creation of the Sonoran Desert Conservation Plan, an "innovative approach to species and habitat protection in concert with land-use planning in the community". As a Supervisor, Raúl also "continued his advocacy for working families through passage of a bond package that contained a $10 million commitment to reinvest in older, poorer neighborhoods and to fund a county housing trust". The Arizona Wildcat, the University of Arizona's daily newspaper, confirmed Grijalva's past membership of the radical separatist group MEChA in a story it ran Nov. 10, 1997, about a "MEChA reunion." Raul Grijalva has a long history with the Communist Party USA. 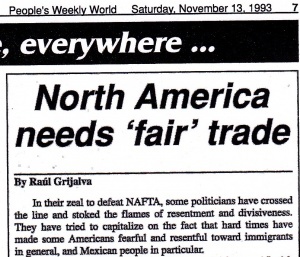 In 1993 Raul Grijalva, identified as a member of the County Board of Supervisors for Pima County Arizona, wrote an anti NAFTA article "North America needs 'fair' trade" for the November 13 edition of the Communist Party USA's People's Weekly World. Raul Grijalva has worked in the past with Tucson Communist Party USA supporter Linda Bohlke, including in a campaign against a Tucson property manager. “I think there’s a real problem with J.C. Harry in the sense that ultimately they’re responsible for the fact that the apartment has run into the ground over the last 20 years,’ said Linda Bohlke, a community advocate with the Law Center, a private, nonprofit group focusing on housing and economic rights. At the request of Pima County Supervisor Raul Grijalva, an item to extend the $25,000 contract of J.C. Harry & Associates Inc. until next April was pulled from the Council’s agenda. Grijalva wanted the company sanctioned under the county’s “Bad Boy Ordinance,’ which essentially states that the county will not do business with companies accused of practices that harm others. In August residents of the federally subsidized Fry Apartments planned a `victory’ party. The property manager, J.C. Harry & Associates, resigned Aug. 1. after weathering two years of pressure by tenants at the federally subsidized Fry Apartments, 909 S. Fifth Ave.
Resident Joann Madrid, who was coincidentally was involved in the Communist Party USA dominated Tucson Tenants Union, said she hoped the new manager, the McCallister Co., would invest in much-needed improvements. Madrid and other residents, aided by the Southern Arizona People’s Law Center, had been demanding J.C. Harry clean up what they call slum conditions in the 48-unit complex. Linda Bohlke, who worked for the Law Center, was one of the main campaigners. By the victory party, she had moved to assisting the Tucson Tenants Union. Supervisor Raul Grijalva was among those who wanted to prevent the landlord from doing further work for the county. “I felt they had a public responsibility on their part to provide safe living conditions. If they weren’t doing it for Fry residents, why should we let them manage property for the county?’ Grijalva said. Grijalva is supported by AFSCME, the labor union for City of Tucson and Pima County employees. The principal spokeswoman for AFSCME is Linda Bohlke. Bohlke has supported Grijalva for a long time and collected nominating signatures for Grijalva in his congressional campaign. Bohlke identifies herself on her voter registration as a Communist. Arizona Communist Party USA chair Lorenzo Torrez was a pioneer in the struggle for Mexican American political representation. According to fellow party member Steve Valencia. "I always say: Before Ed Pastor and Raul Grijalva, there was Lorenzo Torrez." Pastor and Grijalva are Arizona's first two Mexican Americans members of the U.S. Congress. But Torrez ran for Congress before they ran, and also boldly ran against Republican Senator Barry Goldwater. "Lorenzo told us it is time for these majority Latino districts to be represented by a Mexican American," said Valencia. "He wanted voters to see a Latino name on the ballot." When Pastor declared his candidacy, Torrez rallied the Tucson CP club to join in the effort. Pastor's victory in 1991 set the stage for Grijalva's election in 2002. Ed Pastor and Raul Grijalva both became members of the far left Congressional Progressive Caucus. "People gain in Arizona primaries"
The Communist Party USA paper Peoples World, September 21, 2002 issue carried an article on page 8 "People gain in Arizona primaries." The article by local Party leader Joe Bernick dealt mainly with Raul Grijalva's victory in the recent Democratic Party primary. The tireless efforts of hundreds of grassroots volunteers dealt a blow to the corporate establishment here and their attempt to dominate Southern Arizona politics in the Sept. 10 primary election. Long-time progressive Raul Grijalva routed seven other candidates to win the Democratic nomination for CD-7, one of Arizona’s two new Congressional seats. Facing weak opposition, in a district where Democrats outnumber Republicans by almost three to one, Grijalva expects to become only the second Mexican American ever elected to Congress from Arizona, and the first from Southern Arizona. As a Pima County Supervisor and Tucson School Board member Grijalva consistently fought for working peoples’ interests. The Grijalva campaign was a textbook example of how to conduct a peoples’ campaign, beginning with its name: “A whole lot of people for Grijalva.” Hundreds of people came out seven days a week, sometimes twice on Saturday, to wear out tons of shoe leather. Starting in early summer, when temperatures routinely exceed 100 degrees, volunteers knocked on every door, conducted voter registration, signed people up to vote by mail and most importantly, they talked to people about the issues and Grijalva’s track record. Campaigners canvassed voters, often two or three times, at their homes. Carloads of volunteers visited rural communities. Many more volunteered thousands of hours doing office time, phone work and preparing bulk mailings. Campaigners reflected the racial and national diversity of the district, which is more than half Mexican American, includes three Native American nations and most of Tucson’s African-American voters. The labor movement and environmental activists played an important and visible role. The big business establishment tried to derail Grijalva by bankrolling the campaign of State Sen. Elaine Richardson, and encouraging several popular Latino candidates, so as to split the Chicano vote. Richardson was widely seen as pro-developer. Sharing a victory and campaign headquarters with Grijalva was Pima County Supervisor Richard Elias. Elias ran to complete the office vacated by Grijalva. The developers and other corporate interests wanted to gain complete control of the five-member County Board, which has two Republican members, by supporting Elias’ opponent in the Democratic primary. Elias won decisively. A model peoples’ campaign in Southern Arizona swept Raul Grijalva into Congress and helped elect Democrats Janet Napolitano as governor and Terry Goddard as attorney general. Beginning in early summer, volunteers spread out through the neighborhoods, knocking on doors, registering new voters and talking about the importance of electing candidates who will represent the interests of working people. The campaign for one of Arizona’s two new congressional seats concentrated on the section of the district inside metropolitan Tucson consisting of the city’s predominantly Chicano South and West sides and the predominantly white neighborhoods surrounding the University of Arizona. Grijalva had represented much of this area for 10 years as County Supervisor, and for 12 years as member of the School Board. This area is home to a majority of the voters in the new district. The local business establishment knew they couldn’t defeat Grijalva in the general elections, so they encouraged a whole slew of candidates in the September primary. His main opposition was State Sen. Elaine Richardson. Richardson, amply financed by business interests, raised three times as much money, and had the support of the local daily papers and Emily’s List. Emily’s List is an organization committed to funding women candidates who support women’s issues and have a good chance of winning. In response to the group’s support of Richardson, 200 women attended a press conference to announce the formation of 'Adelita’s List,' committed to electing Raul Grijalva and pointing to his 30 years of commitment to the fight for equality. As soon as Grijalva’s campaigners began knocking on doors, they found that Grijalva’s uncompromising support for working people, for better schools, against racism and as a lifelong environmentalist were well known and respected. The AFL-CIO also played a major role in the campaign walking, staffing phone banks and helping with resources. The Grijalva campaign energized volunteers and led to a much higher than usual voter turnout in minority neighborhoods. Arizona’s newly elected Governor, Janet Napolitano, squeaked through on the strength of these new voters. She is the first Democrat elected as Governor of Arizona since Bruce Babbitt won 20 years ago. The campaign helped many other progressive candidates get elected. Richard Elias, who ran a joint campaign with Grijalva, managed a good primary victory to succeed Grijalva as a progressive County Supervisor. Elias faced no opposition in the general election. Adelita Grijalva, Raul’s daughter, was one of two new labor-endorsed candidates for School Board in the Tucson Unified School District. She and lawyer Bruce Burke ousted right winger Rosalie Lopez, who had been the Republican candidate against Raul Grijalva in the last County Supervisor race. In the Sunnyside School District, another large south side district, Eva Carrillo Dong and Tony Silvain were swept into office with the support of labor and the Grijalva campaign. At a meeting of the National Board of the Communist Party USA in South Chicago, on the last weekend of January, 2003, an Arizona AFSCME activist stated "Using street heat tactics, all of labor worked to back one candidate Raul Grijalva in Tucson...And we won!. Tucson Communist Party USA supporter Susan Thorpe wrote an article covering the 2002 Grijalva campaign for the People's World, November 8, 2003, page 5 entitled "Arizona: Grassroots can beat big bucks"
Nevertheless, here in Tucson, we are gearing up for local elections in 2003 and the presidential election ahead in 2004 by using the same tactics we did in 2002 to get Raul Grijalva elected to Congress. Pima County, which contains most of Grijalva’s district, had a 67 percent voter turnout for the November 2002 election – the second highest in the entire United States. This is mainly because for months on end, teams of volunteers, every Saturday and Sunday – and weekdays as well – walked all the precincts three to five times in the sweltering 105-plus degree heat all summer long, getting vote-by-mail requests signed, registering voters, and dropping information brochures behind screen doors and hanging on doorknobs. We tracked the reception from each household, refreshed information over and over again in computers to generate the next walking lists, had art sales and house parties to fundraise. We followed up on election day by walking all the precincts twice more that day, making phone calls to remind folks to vote, driving people to the polls, manning all the voting locations – whatever it took. Massive effort from many folks for maximum payoff: That is what it takes. The election night party was incredible, with folks trailing back to Grijalva campaign headquarters wet and windblown after a raging storm in the late afternoon soaked the volunteers walking precincts and manning voting locations. Congressman Raul Grijalva is proving to be a wonderful voice for the people of Arizona. And our movement and those important connections made during his campaign are still alive in Tucson. On Monday September 26 we participated in the peace movement lobby day at the capitol. We met with Rep Raul Grijalva who said he would work to help build our campaign. We spoke to the staff of Rep Luis Gutierrez and Rep. Xavier Becerra who were supportive of our efforts. We also spoke to the staff of the Congressional Hispanic Caucus and the district staff of Rep Grace Napolitano the current caucus chair. The caucus staffer told us we needed more signers, more leaders and organizations on our lists in many states to have real impact. The staffer for Napolitano indicated our call for bringing the troops home now was not responsible as they (the caucus) were advised a 'bloodbath' would ensue. We assured them we would continue building our campaign and remain in contact with them. We also went to all the offices of the Congressional Hispanic Caucus and presented them with our petition, contact information, and asked that the representatives to sign our petition. On July 13 2005, five Raging Grannies were arrested in Tucson for protesting the war on Iraq. Their alleged crime was entering a military recruiting office and asking to enlist in the U.S. Army, so young soldiers stationed in Iraq could safely return home. A year later the Grannies — all old enough to be grandmothers, and some of them veteran peace activists — are still raging against war in the Middle East and injustice at home. On the anniversary of their arrest, 14 black-shrouded Grannies, joined by 40 supporters, rallied at the federal courthouse. They then marched to Republican Sen. John McCain’s office to deliver a petition on Iraq demanding an immediate end to the U.S. occupation, the closing of all U.S. military bases and the removal all U.S. mercenaries and corporate involvement. Earlier the Grannies sang some of their signature protest songs. They also heard from Raging Granny and Communist Party USA leaderCarolyn Trowbridge and listened to a reading of an antiwar speech by Rep. Raul Grijalva (D-Ariz.). Congressman Raúl M. Grijalva hosted a town hall regarding the health and welfare of Arizona’s senior citizens on Wednesday, July 1 2009, St. Mary’s Hospital, Tucson, AZ. Congressman Grijalva was joined by Jim Murphy of Pima Council On Aging, Carolyn Trowbridge of Quality of Life and Care Alliance, Wendy Cevallos of the Attorney General’s office, Dr. Mindy Fain of UA College of Public Health Center for Aging, Robin Landers of the City of Tucson Senior Center Representative, and Deborah Totten from Carondolet Health Network. Key attendees included Salvador Barajas, Sunnyside School Board Member Magdalena Barajas, Rolande Baker, Joe Bernick, Mary Carmen Donaldson, Hon. Dan Eckstrom, County Supervisor Richard Elias, Tucson City Council Member Richard Fimbres, TUSD Board Member, and daughter of Raul Grijalva, Adelita Grijalva, James Hannley, Rigoberto Lopez, Raul Nido, Laura Portillo, Manuel E. Portillo, Tucson City Council Member Regina Romero, Albert Siqueiros, Janet L. Valencia and Steve Valencia. Baker, Bernick, Hannley and both Valencias were all affiliated with the Arizona District Communist Party USA. Over 200 people turned out on Sept. 27 2001 for an interfaith service here honoring Cesar Chavez. Participants pointed out that the Sept. 11 tragedy highlights the need to learn from Cesar Chavez, who "struggled for justice and dignity while practicing nonviolence". A march was held the next day, which was addressed by Pima County Supervisor Raul Grijalva. Two of the five supervisors, Grijalva and Dan Eckstrom are strong supporters of the campaign. On March 29, 2003, Raul Grijalva sponsored and addressed the Third Annual Cesar Chavez Day March and Rally for Peace. Over 650 marchers, many carrying signs that read, “Peace is Patriotic,” celebrated the Third Annual Cesar Chavez Day March and Rally for Peace. University of Arizona Women’s Studies professor, Raquel Rubio Goldsmith, opened the day’s festivities which brought together a "historic coalition for peace and justice". Endorsed by 48 community groups and by Congressman Raul Grijalva , the event provided a "spirited challenge not only to war, but to all attacks on people of color and working families everywhere". Rep. Grijalva, whose 7th Congressional District includes Yuma, Chavez’s birthplace, told the rally, “these are troubling and saddening times.” He called on the crowd to exercise their responsibility and rights as Americans to change the country by voicing their opinions in a non-violent way. In June 2015, Communist Party USA activist and high school teacher Ray Siqueiros received an award from Rep. Raul Grijalva. In September 2015 Arizona's Republican Sen. John McCain introduced legislation that exempts pet projects from environmental protection laws. McCain has already been trying to attach S750 to the 2016 National Defense Authorization Act (NDAA). Chuck Kaufman of the Alliance for Global Justice explains, "The best way we can defeat this bill is to bring it out into the light of day. If we expose McCain's underhanded tactics, S750 will likely die just like a vampire in the sun. But if he can sneak it by as an amendment on a larger bill, that's how it will get passed." A companion bill, HR1412, has been introduced in the House by Arizona Rep. Matt Salmon, also a Republican. S750, a border militarization bill that, if passed, would exclude new surveillance installations and other border patrol activities from environmental protection laws. The bill would apply to federal lands within 100 miles of the U.S.-Mexico border in Arizona and parts of California. Arizona Rep. Raúl Grijalva, ranking member of the House's Subcommittee on Public Lands and Environmental Regulations, has introduced legislation to repeal the Oak Flat swap. Sen. McCain claims S750 is needed for new security installations and to give the U.S. Border Patrol and Immigration and Customs Enforcement agents unimpeded access to federal lands. However, Dan Millis, Director of the Sierra Club's Borderlands Campaign, noted at a recent community forum at the Global Justice Center in Tucson, Arizona, "It's a very effective argument because you think, 'They don't have access to federal lands? Of course they have access to federal lands! They have more access than anyone else to federal, private, all the lands along the border....So he is spreading the notion that Border Patrol is somehow not granted access to these areas....Well, that's completely false." José Matús, director of the Indigenous Alliance Without Borders, talked about the regular impositions border agents make on people living in indigenous lands crossed by the border: "They always have had the authority to patrol....They come in their trucks, bikes, waking people up at all hours of the night, asking people for their documents....They've always had that power 100 miles north of the border, but now they want to give them everything, waving all our rights." "I think, based on what the Apache nation has done on this issue...it's going to be much more difficult politically...to do that same kind of sneaky process....And for that we should be very grateful to the Oak Flat advocates and the Apache nation for raising this issue...[to] the embarrassment of McCain and the political travesty of doing something in that way and not allowing it to be fully digested and discussed...."
"It's a two pronged agenda.... Part of the agenda...[is] to end any legislative hope... that we would end up with something semi-rational in terms of comprehensive immigration reform because this bill is about enforcement only-only enforcement....So this bill...suspends any possibility in this cycle of doing anything rational and right. It shifts the debate into...enforcement as opposed to dealing with family unification and all the other aspects of immigration that need to be dealt with. "The other agenda is about attacking bedrock environmental laws that have been on the books for 50, 40, 45 years.... When we suspend not only 37 laws but all the laws along that 100 mile cut off we're also suspending sacred sites, cultural resources, historic...protections, all part of a Native American legacy in the Southwest that despite colonization has existed and survived....It's both about immigration and the environment and citizen accountability and participation in decision making....Suspending laws sets a dangerous precedent....Mark my word, once these basic fundamental laws that are part of a legal legacy for this county are suspended we have opened a can of worms for that to become a practice." Immigrant rights activist and founder of Tucson's Coalición de Derechos Humanos (Human Rights Coalition), Isabel Garcia, sees an ominous link between bills like S750 and ecological and climate injustice. According to Garcia, "We have the neoliberal monster and we have the other monster of the military...and we are creating refugees. Then there's the denial on the part of so many people in this country but especially in DC of the impact that we have on climate. We see nothing yet. When the world begins to warm, we will see massive migration. We're already seeing massive migration, but we will see it get huge....Is it any surprise that we have begun to militarize [the border]? Did you see...the military has plans of how we're going to safeguard the United States in case there are mass riots, a mass influx of people? Eventually we created Homeland Security....Do you see how it begins to normalize? We say, 'Well, the military should be involved in borders, why aren't they involved in policing our borders? And what's the difference between the military and Homeland Security, anyway?' And before you know it, we don't know the difference." Garcia sees this militarization happening in many places and at many levels. She observes, "There was a bill in the [Arizona] legislature...to keep secret the names of police officers who have killed. Border Patrol already does this. They've been hiding the names-who does that? Who does that? The military. The military has no accountability. Nobody has to say who killed whom. And we're moving more and more to this militarized form, and of course the environment is part of it, too. We're all connected, all of this is all totally connected...."
Long time Board chair was Democratic Socialists of America member Jim Scheibel, a former Mayor of Saint Paul, Minnesota. Grijalva was endorsed by 21st Century Democrats in the 2002 election cycle. In 2003 Rep. Raúl Grijalva served on the Progressive Majority Advisory Committee. Raul Grijalva was on the list of 129 speakers at the 2003 Take Back America conference, which was organized by the Institute for Policy Studies, and Democratic Socialists of America dominated Campaign for America's Future. Grijalva was on the list of 114 speakers (which included George Soros) at the 2004 Take Back America conference..
Raul Grijalva was on the list of speakers at the 2009 America's Future Now conference, which was organized by the Institute for Policy Studies, and Democratic Socialists of America dominated Campaign for America's Future. Raul Grijalva is on the list of Congressional Representatives who have participated in hearings/briefings since 1998, with the very radical Institute for Food and Development Policy/Food First, founded by Frances Moore Lappe (Democratic Socialists of America, Institute for Policy Studies) and Joseph Collins (Institute for Policy Studies), authors of the book "Food First". In 2004, the Arizona Secretary of State accepted petitions, signed by over 190,000 voters, to place a "right-wing initiative" on the November ballot. The proposition "uses racism and immigrant bashing in an attempt to restrict the right to vote and to divide the working class". Rep. Raul Grijalva (D-Ariz.) "summed up the Act well" at an anti-PAN press conference: “This (PAN) is motivated by hate. Immigrants are not the root cause of why our country went to war, why millions are denied medical coverage, why too many remain unemployed or why we face so many other problems. This initiative is a mean- spirited effort to deny people their civil and human rights.” Grijalva promised an aggressive campaign to defeat PAN if it made it on the November ballot. In August 2008 the Obama Campaign announcedthe formation of its National Latino Advisory Council, highlighting the continued growth of support Senator Obama is receiving in the Latino community nationwide. The Phoenix 5 mile march and rally held Saturday, May 29, 2010, in solidarity against SB1070 was quite a sight to see. SEIU Executive VP Eliseo Medina joined a laundry list of influential minds including Rep. Raul Grijalva, Rep. Luis Gutierrez, National Day Laborer Organizing Network Executive Director Pablo Alvarado, AFL-CIO President Richard Trumka, Co-founder of United Farm Workers Dolores Huerta, singers Jenni Rivera and Alex Lora of El Tri. In 2009, Raul Grijalva served on the Advisory Board of Progressive Democrats of America. Raúl Grijalva signed the letter. This fall, in the House, PDA is focusing attention and effort on several strong progressives worthy of note and support in hopes of flipping several seats from red to blue. In California, Jerry McNerny is running a strong race against an incumbent Republican. In Michigan, Tony Trupiano, with one of the nation’s strongest grassroots efforts, has his sights on an open seat in a Republican-leaning district. And in New York, anti-nuclear activist John Hall has won the Democratic nomination to challenge a four-term incumbent Republican. In Arizona, while the local PDA primary candidate, Jeff Latas, did not prevail, PDA will now enthusiastically join forces with PDA Board Member Rep. Raul Grijalva and support the nominee, the equally progressive Gabby Gifford, as well as PDA-backed Herb Paine, who won a razor-thin primary victory in a neighboring district. In 2012, Raul Grijalva (AZ 3), was one of 14 leftist Congressional and Senate candidates endorsed by Progressive Democrats of America, an organization dominated by members or affiliates of Democratic Socialists of America and the Institute for Policy Studies. Progressive Central:The Peoples' Inauguration was held Saturday, January 19, 2013, at the UDC David A. Clarke School of Law 5th Floor Moot Court Room, 4340 Connecticut Avenue NW, Washington, DC. Rep. Raúl Grijalva (D-Ariz.), co-chair of the Congressional Progressive Caucus, told In These Times that he was worried his party leadership might agree to a future budget deal that could include cuts to Social Security. In 2018 Progressive Democrats of America endorsed Rep. Raul Grijalva, AZ-03. In 2008, the U.S. Congress' most powerful committee, "Ways & Means" was heavily influenced by members of the Congressional Progressive Caucus including Chairman Charles Rangel, Pete Stark, John Lewis, Xavier Becerra and Jim McDermott. Congressional Progressive Caucus Vice Chairman Raul Grijalva and Danny Davis, joined "Ways & Means" late in the year. On November 19 2008 the Congressional Progressive Caucus announcedits elected leadership for the 111th Congress. As of February 20 2009 Raul Grijalva was listed as Co-Chair of the Congressional Progressive Caucus. As Co-Chair of the Congressional Progressive Caucus (CPC), Raúl has championed affordable health care for every American and has pushed for job creation measures that focus on improving America's infrastructure and economic base. He has announced his support in the 112th Congress for the Fairness in Taxation Act, which would create new tax brackets for millionaires and billionaires who currently enjoy generous loopholes that prevent them from contributing a proportionate amount to our economic recovery. He is a co-sponsor of the Fair Employment Act of 2011 to outlaw discrimination against the unemployed in hiring decisions, and wrote an op-ed in mid-March to explain his reasons. Grijalva is chair of the Congressional Hispanic Caucus Education Task Force. In 2013 Raúl Grijalva was a member of the Congressional Hispanic Caucus. In May 2013, Raúl Grijalva was listed as an associate member the of the Congressional Asian Pacific American Caucus. Rep. Raul Grijalva, on the day of the signing of SB 1070, called for a national boycott of Arizona- and in so doing, opened "one of the greatest opportunities to influence Arizona politics, to repeal SB 1070 and strike a blow against racism and change Arizona's legislature". On Dec. 22, 2009, thirty-three U.S. Representatives wrote to Secretary of State Hillary Clinton, calling on her to request that the Israeli Government end the ban on student travel from Gaza to the West Bank. 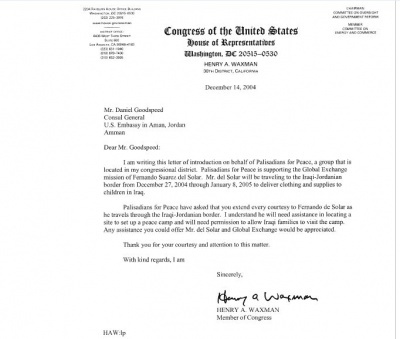 Raul Grijalva was one of the signatories of the letter. The entire letter together with a complete list of signatories can be read by clicking here. On Jan. 27, 2010, U.S. Representatives Keith Ellison and Jim McDermott led 52 other members of Congress in signing a letter addressed to President Barack Obama, calling for him to use diplomatic pressure to resolve the blockade affecting Gaza. Raul Grijalva was one of the signatories of the letter. The entire letter together with a complete list of signatories can be read by clicking here. The Council for a Livable World, founded in 1962 by long-time socialist activist and alleged Soviet agent, Leo Szilard, is a non-profit advocacy organization that seeks to "reduce the danger of nuclear weapons and increase national security", primarily through supporting progressive, congressional candidates who support their policies. The Council supported Raul Grijalva (D-AZ) in his 2010 Congressional election campaign. Rep. Raúl M. Grijalva has been a tireless champion of progressive causes in the House of Representatives and is a Co-Chair of the Congressional Progressive Caucus. He has earned a 100% score from PeacePAC every year he has been in office. Grijalva has been a leader in the effort to bring American troops home from Iraq and Afghanistan. In the last several years, he has voted for legislation to cut funding for expensive and unnecessary weapons systems and costly and ineffective missile defense programs. He opposed the U.S.-India deal on nuclear cooperation. Grijalva has been a leading advocate for comprehensive immigration reform. He supports measures to bring millions of undocumented residents into compliance with the law and to ensure that law enforcement agencies can track who is living in this country. In 2010, when Arizona Gov. Jan Brewer signed Arizona’s controversial immigration law, SB 1070, Grijalva called for civic, political and religious organizations not to hold their conventions in Arizona. Grijalva is personally popular with voters but he faces tough campaigns in both the primary and general elections. He will need significant financial resources to stay competitive for the long haul. You can help this progressive champion by making a check out to “A Whole Lot of People for Grijalva” and mailing it to Council for a Livable World, or by donating online by clicking the button on this page. Rep. Grijalva sent Daniel Brito, to Honduras and El Salvador for 3 days in May/June 2010. The trip was courtesy of a $4,107.39 grant from the Institute for Policy Studies connected Center for Democracy in the Americas... "Assess the situation in Honduras and El Salvador and current U.S. policy implications in the countries" . In mid November 2010, a delegation from the Committee to Stop FBI Repression returned home from several days of bringing the "issue of the FBI raids and grand jury subpoenas of people doing international solidarity work and anti-war organizing to the U.S. Capitol". Three supporters of the Marxist-Leninist Freedom Road Socialist Organization/FightBack!, Deb Konechne of the Committee to Stop FBI Repression, Anh Pham, who is facing a reactivation of her subpoena and Joe Iosbaker, whose home was raided, spent two days meeting with U.S. Representatives on the issue. The delegation asked each Congressperson to sponsor a “Dear Colleague” letter condemning the raids and grand jury subpoenas. In the two days, the delegation met with either the Congressional Representative’s staff or the Representative themselves from the following 16 offices: Tammy Baldwin (WI), John Conyers (MI), Danny Davis (IL), Keith Ellison (MN), Raul Grijalva (AZ), Luis Gutierrez (IL), Mike Honda (CA), Jesse Jackson, Jr. (IL), Dennis Kucinich (OH), Barbara Lee (CA), Jim McDermott (WA), Jim McGovern (MA), Bobby Rush (IL), Linda Sanchez (CA), Jan Schakowsky (IL), Maxine Waters (CA). The "meetings were positive, with all the offices expressing genuine concern about the situation. In some cases, because of the outpouring of calls from around the country, the U.S. Representatives were aware that the delegation was in Washington D.C. and the offices made time on their schedules to meet with the delegation. This reinforces the continuing importance of the solidarity work taking place around the country." In 2011, Raúl Grijalva, served on the Board of Directors of the Center for Progressive Leadership. After weeks of Republican attacks on President Obama in rural Iowa, House Minority Leader Nancy Pelosi and Rep. Barbara Lee on Tuesday August 17, 2011, took to the pulpit of an African American church in Oakland to hear directly from voters and defend the president and Democrats on the most critical issue of the 2012 presidential race - jobs. "It is a time in our country when the American people know ... that serious job creation must take place," said Pelosi, speaking to reporters before addressing a supportive crowd of hundreds at the Acts Full Gospel Church in East Oakland, one of California's staunchest Democratic strongholds. Dozens filed up to mikes to tell their stories of unemployment. The session, organized by the Congressional Progressive Caucus, was at times raucous, with some heckling or angrily chanting that it is time to "tax the rich." Barbara Lee, who leads the Congressional Black Caucus, charged that Republicans, on the 224th day of their leadership in the House, had failed to produce a jobs bill or to deliver any solid proposals. But both Pelosi and Lee, accompanied by Rep. Mike Honda of San Jose and Rep. Raul Grijalva of Arizona, also aimed to draw sharp contrasts between Republican and Democratic agendas on jobs. "What's most exciting about the green economy is that it offers the possibility to have manufacturing again, to actually create things ... in both the private and the public sector," she said. "And the greatest growth sector right now is clean energy." Ellis-Lamkins drew applause when she said that, too often, the focus of politicians is "about who is in the back of the room yelling the loudest." "What the folks in Washington, D.C., would have us do is fight each other," she said. "I want to make sure the story of tonight is that people of color need jobs ... solutions and jobs." In 2011, the International Award, was presented by Raúl Grijalva (D-AZ) to Bethlehem, The Migrant's Shelter (Mexico) The award ceremony was presented at the National Press Club in Washington, D.C., on Oct. 12. .
"Responding directly to national demand for a massive jobs program", members of the Congressional Progressive Caucus, December 13, 2011, introduced the Restore the American Dream for the 99 Percent Act into the House of Representatives. The bill would create more than 4 million jobs and reduce the deficit by more than $2 trillion over the next 10 years, making it the biggest government effort thus far to marshal the resources needed to address the economic crisis. While no one expects the bill to pass in the Republican-controlled House, it is viewed by many as outlining what really must be done if the economy is to be restarted in a way that benefits the overwhelming majority of the population. Progressive Caucus Co-Chairmen Reps. Keith Ellison, D-Minn. and Raul Grijalva, D-Ariz., presented the legislation at a news conference in the Capitol. The bill would create several "corps" that will offer government jobs to the unemployed doing essential work including repairing school buildings, maintaining public parks, building neighborhood energy efficiency and conservation projects, and providing health care and other public services in underserved areas. One of the corps would be specifically devoted to re-hiring teachers and first responders laid off by cash-strapped state and local governments . There are provisions in the bill that require 75 percent of the goods and services purchased by the federal government to be made in America, provisions designed to help small businesses get federal contracts, and allocation of $50 billion alone for highway, public transportation and electrical grid improvement projects. The bill provides for tariffs in cases where what the lawmakers called "currency manipulation by China" results in "artificially driving down the cost of Chinese imports." One clause in the bill protects both the long-term unemployed and wounded veterans from hiring discrimination. The bill includes provisions that would raise $800 billion through a surcharge on millionaires and billionaires, end tax subsidies for oil companies, and impose a tiny financial transactions tax on Wall Street. There would be other budget savings through ending the war in Afghanistan and slashing $200 billion from the defense budget by eliminating unneeded weapons systems and cutting in half the military forces currently stationed in Europe. The bill also strengthens health care reform by creating a public health insurance option that would be available through health care exchanges. That measure alone, the lawmakers say, would drive down spending federal health care spending by $90 billion. The bill would allow Medicare to bargain with pharmaceutical companies to get bulk discounts, a move blocked by Republicans in the past. Supporters say it would help save more than $150 billion. To save Social Security benefits and trust fund, the legislation would raise the cap on earnings taxed by Social Security above its current $106,800. "The Republicans want the people to think about how bad things are and to focus their anger on the president," said Grijalva "They don't want people to count the things the Republicans voted down that would have helped this country." "This bill," said Ellison, "shows we can put people to work today by building for tomorrow." Since 2005, the Center for Community Change has "recognized some of our nation’s top community leaders for advancing the cause of social justice, with a particular impact on the lives of low-income people and people of color. CCC’s Community Change Champion Awards are presented to individuals and organizations who are our heroes in the social justice movement". June 18 2013, Rep. Justin Amash (R-MI), Chairman of the House Liberty Caucus, and Rep. John Conyers, Jr. (D-MI), the Ranking Member on the House Judiciary Committee, announced the introduction of bipartisan legislation to address National Security Agency surveillance. Congressional endorsers of the proposal included Raul Grijalva. In 2013 Progressive Democrats of America assigned activists to deliver their material to almost every US Congressman and Senator, Jeff Rich was assigned as the contact for Rep. Grijalva. Signatories included Rep. Grijalva . JStreet endorsed him again in 2016.
. Grijalva is a strong supporter of pro-Israel, pro-peace initiatives on the Hill and held on to his seat despite a surprisingly close election in 2010 and tough races in 2012 and 2014. JStreetPAC is proud to re-eendorse Rep. Grijalva in 2016..
August 16, 2012, Arizona Festivities - AARA members celebrate Social Security's 77th year with Congressman Raul Grijlalva - a great champion! Marking the 78th birthday of Social Security, the Arizona Alliance for Retired Americans members, leaders and community activists celebrated on Wednesday, August 14, 2013, at 11:30am at Armory Park Senior Center Tucson, . Attendees will celebrate the programs’ successes and released a new report detailing the impact of these programs on state residents. WHAT: Social Security Birthday Party and Awarding of the “Champion of Social Security Award” to Community Activist Tino Torres and Congresswoman Ann Kirkpatrick WHO: Congressmen Raul Grijalva and Ron Barber, Congresswoman Kirkpatrick’s Deputy Director Blanca Varela, Local leaders, 80-100 area retirees, Arizona Alliance for Retired Americans leadership. 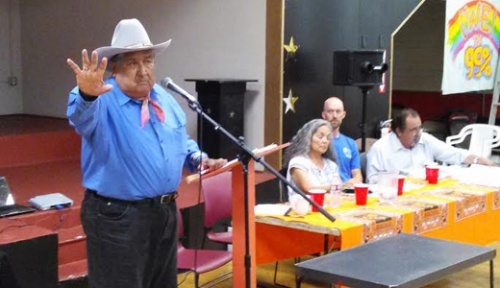 In Tucson, the Alliance for Retired Americans hosted a Social Security Birthday Celebration featuring Rep. Raul Grijalva (AZ-3), August 14, 2014. The Alliance for Retired Americans Political Action Fund endorsed Raúl Grijalva in 2012, 2014. 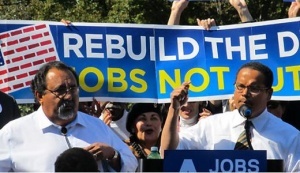 Signers of New York City Mayor Bill de Blasio's May 12, 2015 launched The Progressive Agenda to Combat Income Inequality included US Rep. Raul Grijalva. On May 25th 2015. U.S. Senator Tom Udall (Dem., NM), the author of a bill to expand U.S. telecommunications trade with Cuba (S.1389), led a delegation of fellow Democrats on a visit to Cuba: Senator Al Franken (MN) and Congressmen Raul Grijalva (AZ) and John B. Larson (CT), all of whom support ending the U.S. embargo of Cuba. Their visit included a meeting with Cuba’s Foreign Minister, Bruno Rodriguez Parrilla, as well as meetings with Cuba’s Ministries of Foreign Trade and Foreign Investment and Agriculture as well as self-employed members of small cooperatives and investors from foreign countries. Guests included Sens. Jeff Flake (R-Ariz.), Patrick Leahy (D-Vt.), and Amy Klobuchar (D-Minn.); Reps. Chris Van Hollen (D-Md. ), Karen Bass (D-Calif.), Barbara Lee (D-Calif.), Jose Serrano (D-NY), Raul Grijalva (D-Ariz.); plus administration types including deputy national security adviser Ben Rhodes. NBC anchor Andrea Mitchell slipped through the phalanx of protesters, camera crews, and folks celebrating just outside the gates. REP. RAÚL GRIJALVA: We begin an important diplomatic step today, normalization to follow. Lifting the embargo needs to be done. And discussions about returning land to Cuba that is rightfully theirs—Guantánamo—needs to follow. But today, I think, marks a growing-up day for the United States, where we are going to act like adults in our own hemisphere, quit being punitive with Cuba. And the Cuban people have endured. I visited there two months ago, and their resilience and their strength is unbelievable. AMY GOODMAN: Guantánamo, will it close? Speakers at Netroots Nation 2015, in Phoenix Arizona, one of the largest gatherings of progressives and the Democratic activist base, included Bernie Sanders, Martin O'Malley, Elizabeth Warren, Rosa DeLauro, Donna Edwards, Keith Ellison, Ruben Gallego, Raul Grijalva, Hank Johnson, Robin Kelly, Mark Takano. Rep. Joe Kennedy III (D-Mass. ), chair of the Congressional Transgender Task Force, introduced a resolution in the U.S. House on Monday to recognize violence against transgender people. The original co-sponsors of the resolution are Reps. Michael Quigley (D-Ill.), Donald McEachin (D-Va.), Raul Grijalva (D-Ariz.) and Jackie Speier (D-Calif.) as well as Del. Eleanor Holmes Norton (D-D.C.). National Nurses United 2018 endorsements included Raul Grijalva AZ 3. In August 2018 Medicare For All Congressional Caucus founding members included Representative Raul Grijalva. Raul Grijalva AZ O3 was endorsed by Justice Democrats for 2018. By February 20 2019 endorsers of Alexandria Ocasio-Cortez's HR 109 (Green New Deal) included Raul Grijalva. ↑ PWW, April 5, 2003 page 5 "...in Arizona"
This page was last modified on 19 April 2019, at 16:16.